In a medium sauté pan, heat 1 1/2 tablespoons of the olive oil for one minute over medium heat. Add the onion and carrot, and sauté the vegetables until they are softened, 10 minutes. Add the lentils, sliced garlic, rosemary and bay leaf and sauté for 3-5 minutes more, coating all the lentils. Increase the heat and add the red wine. Bring to a simmer and cook uncovered, stirring, until the mixture becomes dry. Meanwhile, in a saucepan bring the chicken stock to a simmer, then turn off the heat and cover to keep warm. Add the warm chicken stock to the lentils (like cooking a risotto) 1/2 a cup at a time, letting the lentils absorb the liquid with each addition. Repeat, stirring the mixture constantly. 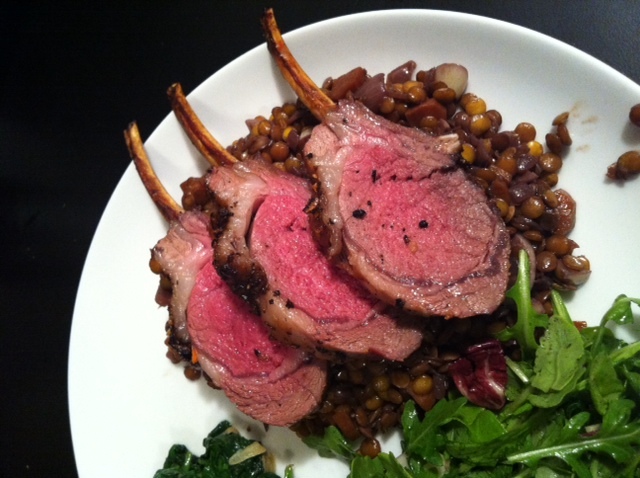 After 30 minutes or so the lentils should be slightly chewy and tender. Season to taste with salt and pepper.